On this page you can see all our previewable arrangements for the score of Riverboat Shuffle. 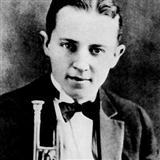 Riverboat Shuffle was composed by Bix Beiderbecke, Hoagy Carmichael. You may view the first page of any score before buying. This should allow you to make a more informed purchasing decision, and with tens of thousands of scores to choose from, there should be one appropriate for you. You can preview all available scores for Riverboat Shuffle one at a time by clicking on this button . The website will always default to show all available sheet music scores available for all instruments (unless you have done a search just for a specific instrument). You can easily alter for which instrument you are viewing the available scores, in the drop down box next to the instruction "change instrument". You can post your customer feedback on any of the Bix Beiderbecke, Hoagy Carmichael arrangements on this song page. Navigate to the Comments tab below, make sure you are logged into your Great Scores account, and after choosing a username, which from then on will be permanently assigned to you for leaving comments, you can type in your review. No spam or URLs, please, as these will be deleted. Are you can avid user of social media such as Linkedin, Twitter, Facebook or Digg? Then you can share this song page on your appropriate social media account, by simply clicking on the share button. Our songs are usually available for a number of different instruments. We also usually offer a variety of arrangements, to give you a better musical choice. In the case of Riverboat Shuffle we have 2 arrangements for 5 instruments.